Baking recipes are easy to come by, but what if you'd like to treat your friends and family to something just a little bit different that's still easy to make and tastes mouth-wateringly delicious – say, Swedish bakes? 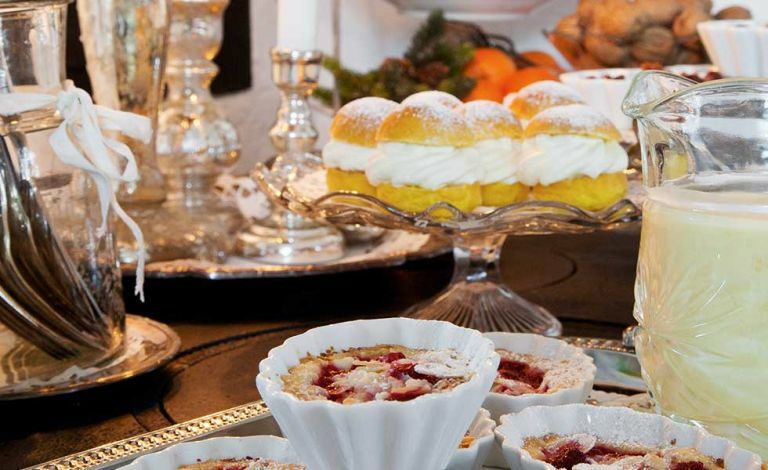 Café owner Jessica Jowilin bakes sweet treats for her business year round – deliciously tempting smells wafting from the windows of her cosy cottage in Lillkyrka, Sweden. And Christmas is no different, although her bakes take on a more festive feel and she particularly looks forward to making a traditional gingerbread house, which she puts on a shelf surrounded by lanterns. Here, she shares three of her favourite yuletide recipes that we would happily eat all year round. See more of our favourite recipes on our food hub page. 1. Pre-heat the oven to 200ºC/400ºF/GM6. 3. Mix all the dry ingredients and add the warm butter, blend well. 4. Grease the baking pan with melted butter, press the dough into the pan and sprinkle with a little potato flour over the bottom. Fill the pie shell with raspberries. Grate the chocolate over the pie and sprinkle with almonds. 5. Bake for about 18 minutes. 6. Serve custard with the pie. 1. Melt the butter with the milk and add the saffron. 2. Crumble the yeast in a bowl and add the salt and the sugar. 3. Add the tepid milk/butter/saffron liquid. 4. Sift flour over the liquid, mixing little by little. Stir in the egg. 5. Mix the dough in a blender for about 10 minutes. 6. Let the dough rise until doubled in size, for about 45 minutes. 7. Roll small balls and put them on a grease proofed paper on a baking tray and cover it with a towel. 8. Pre-heat oven to 220ºC/425ºF/GM7. 9. Let the buns rise for about 30 minutes. 10. Bake in the lower half of the oven for about eight minutes. 11. Allow to cool then cut the buns in half. 12. Grate almond paste and stir in a dash of milk. Fill the buns with the almond paste and the whipped cream. 13. Put on the lid and dust with icing sugar. 1. Pre-heat oven to 175ºC/350ºF/GM4. 2. Mix together all the ingredients for the pie crust and knead into a pliable dough. Roll the dough to about 5mm thickness. 3. Brush the pie pan with melted butter and press the dough into the pan. 4. Bake for about 18 minutes. 5. Roast the nuts on a baking tray for about 10 minutes. 6. Stir together butter with sugar, cream, cocoa, wheat flour and toasted nuts. Bring the mixture to boil, and then let simmer for five minutes until it thickens. 7. Fill the pie shell with the toffee and allow it to cool.